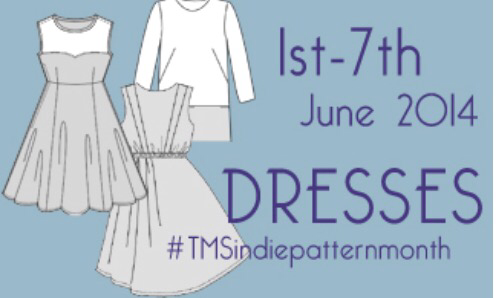 TMS’s Indie Pattern Month was the perfect excuse to shop for new patterns, and to widen my search beyond the usual Simplicity/New Look. 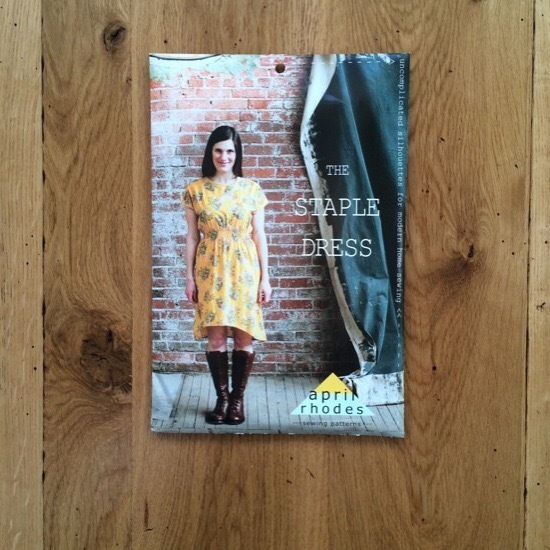 I ordered four patterns in total, including two dress patterns; the Colette Myrtle and April Rhodes’ Staple Dress. I chose it mainly because of the absence of fastenings, coupled with the fact that it’s just the style of dress I love to wear. I wasn’t thrilled about the curved hem, but quickly discovered there was a straight option. Initially I considered using a pale blue candy-striped seersucker, which I felt would be lovely and fresh for a lightweight summer frock, but I eventually decided that the simplicity of this make was the perfect chance show off a bolder print. I had the perfect Amy Butler in my stash. Cutting out was quick and easy, with very few pattern pieces. 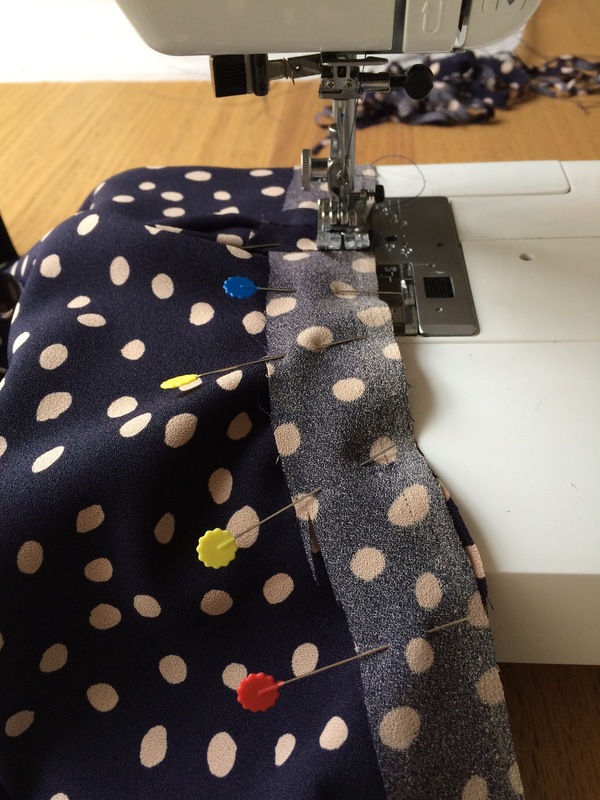 I opted to included the pockets – practical in school for keeping a pen for marking to hand! I thought it could be a chance to experiment with centring a print, but upon closer inspection I found that the flower motif is not exactly symmetrical. There was already a fold down the centre so I just went with that. I would say that this has to be my favourite ever make! So straightforward, logical yet neat, and very clear instructions with photos. I really liked how the shoulders were French seamed then top stitched in place. I just pinked all of the other edges. Even the facings somehow worked perfectly, and the fabric was a dream to press. I really liked how tidy the facings looked internally and externally once completed. There was no down side or low point during this make. 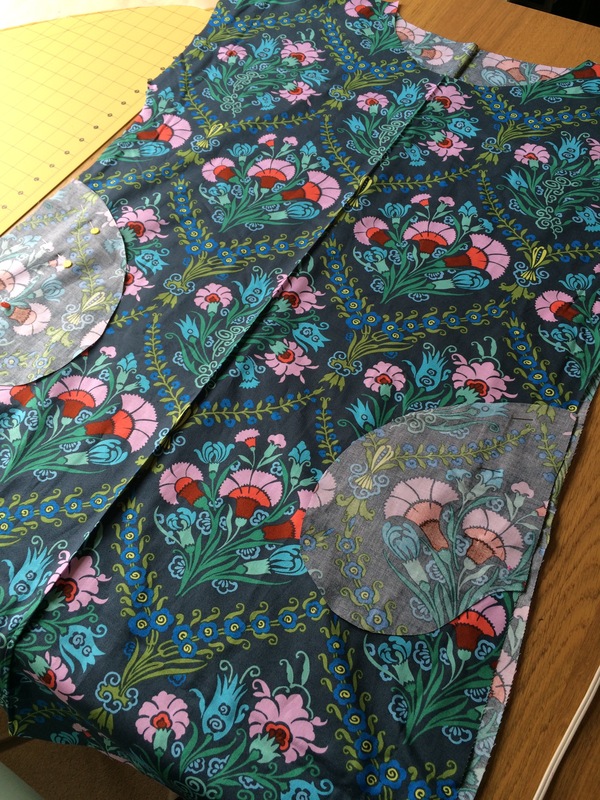 The only adaptation I made was due to the fact I had no shearing elastic, so instead I used a method I learned from a vintage pattern: using regular elastic encased in bias tape. I chose a plain white tape and used a large safety pin to both pull it through AND secure the other end so I didn’t pull it too far – proof I do occasionally learn from my mistakes! The make came together very quickly and I enjoyed every step. I wore it to visit my Nan, who had seen a photo and said she liked the fabric. 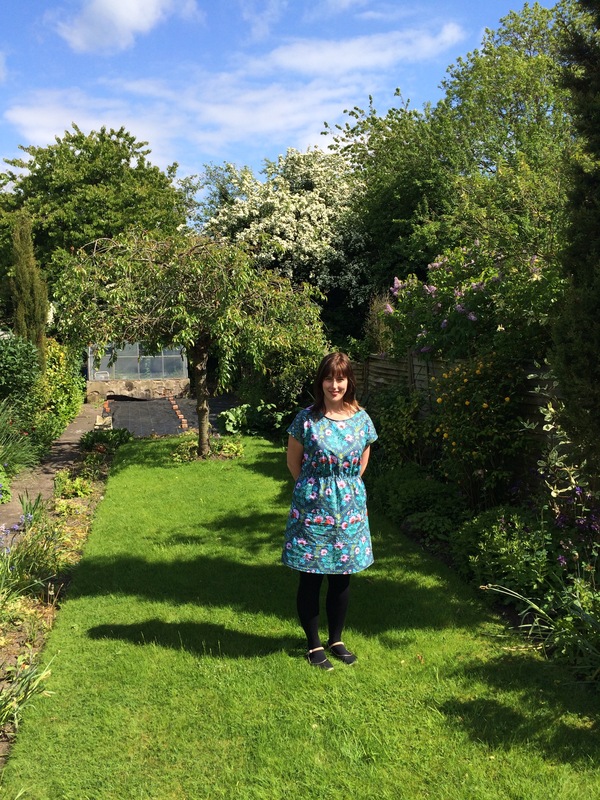 Nice to be able to pose in the sunshine of her garden. Still in my winter tights. 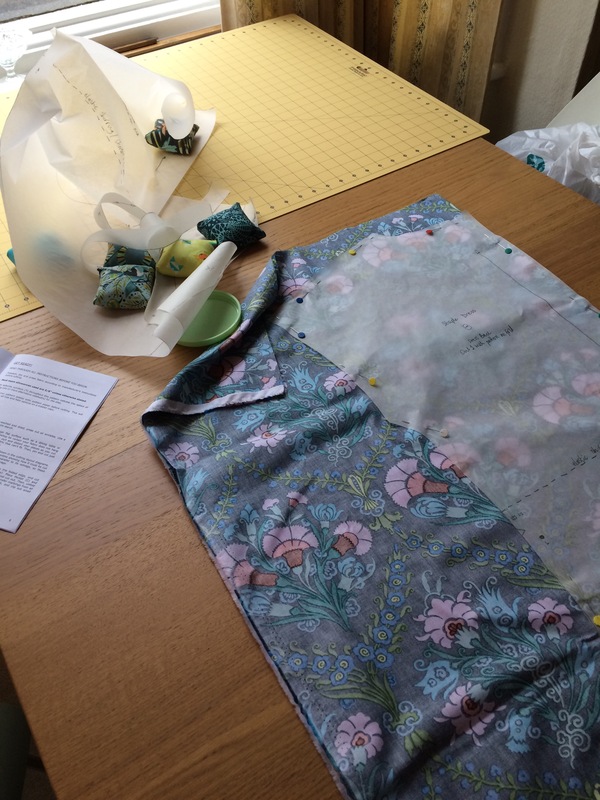 As soon as I had finished this dress I immediately cut out another, and, as it was getting late, sewed it up the following morning. This time I used a fabric I had had in my stash fora few months. I’m not quite sure what it is, a kind of polyester I guess but with a rougher feel, maybe a kind of crepe? 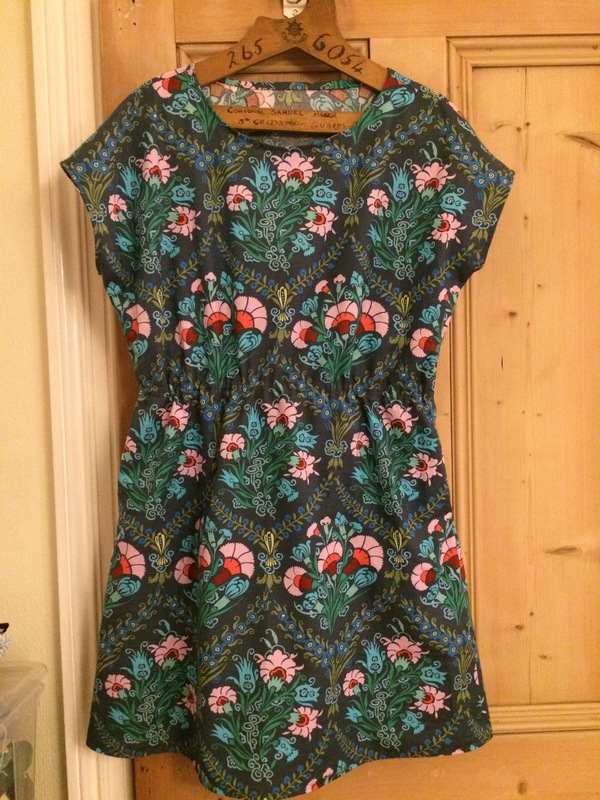 I really like the print, and thought it would hang nicely, but I knew it would be less of a pleasure to sew with and basically had no chance of pressing. This time I omitted the pockets, and because of diminished concentration I messed up the seams meaning they’re just regular and not Frenched. Attaching the facings wasn’t quite as straight forward as the Amy Butler, and it all involved a lot of pinning and re-pinning, which didn’t really surprise me. The fabric is bulkier so the neckline and armhole facings had to have two rows of top stitching and don’t lay quite flat, but hopefully anyone more than a metre away wouldn’t notice. Again I used bias tape and elastic around the waist, although I have since purchased two rolls of shearing for next time. I nipped the waist in more on this one. I’m thinking a nice belt in brown or perhaps red might match this nicely and add a vintage feel? I’m really pleased with both makes and fairly sure this is my new favourite pattern that I will make in a variety of versions. 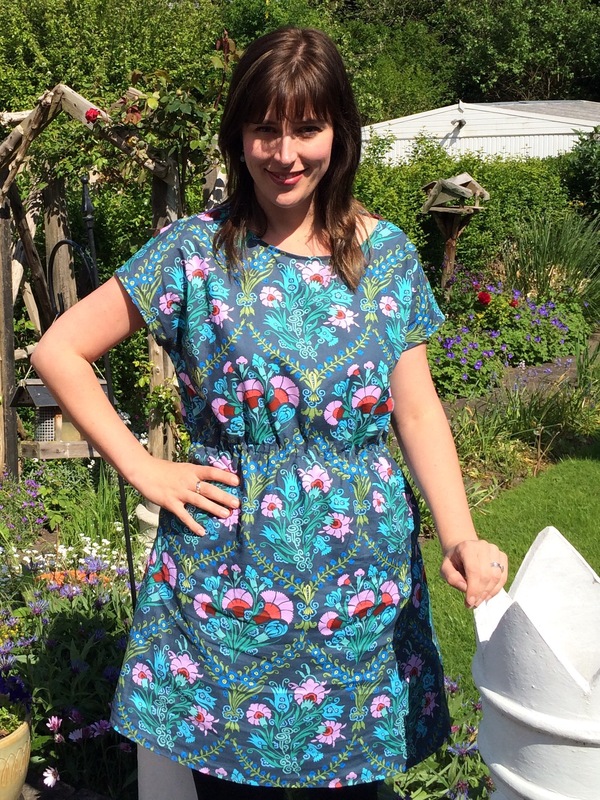 Have you made any other April Rhodes patterns? These are so pretty! 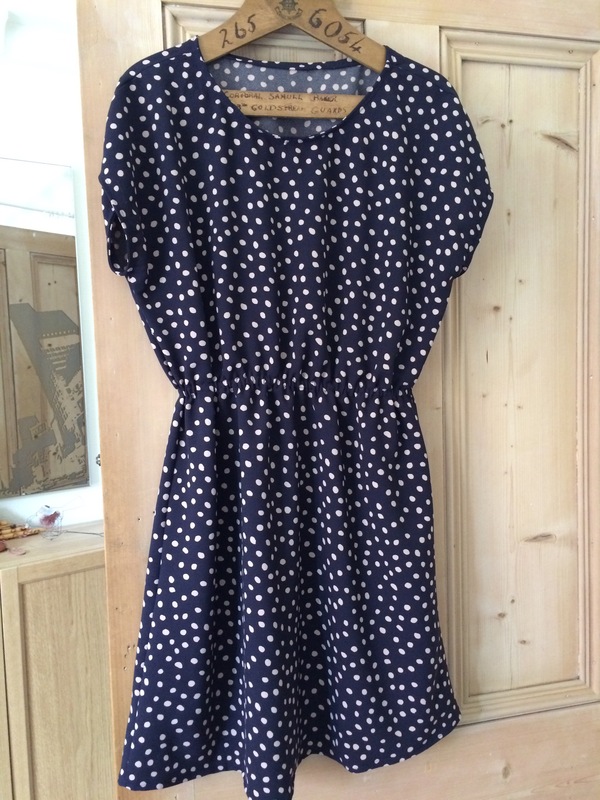 I am drawn to the second version just because of its polka dots but the first is lovely too! They look perfectly sewn. 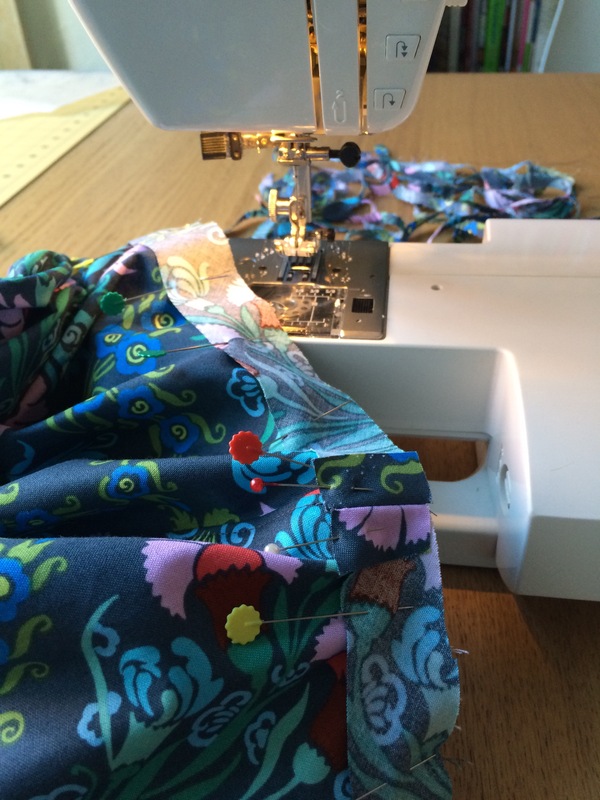 It looks totally different in the two fabrics so it’s great you can sew more using a pattern you love! Thanks, yes I like both but it’s good to experiment with how different fabrics change how it drapes 🙂 I definitely see more on the horizon! Thank you 🙂 I guess of the two the Amy Butler one feels the more casual, but still fine for work I think, and yes, definitely still with tights until it warms up somewhat! Thank you 🙂 it was good to try out the same pattern in two different fabrics. Thank you 🙂 I know, how appropriate eh? Wore the spotty one today and loved it! Now for picking my next TMS challenge makes – have you picked any out yet? That’s great! Not picked any yet I’ve got 2 more dresses to make before I cut anything else out! Thank you 🙂 both from my stash rather than purchased specifically, I like them both for different reasons.